!!!! SDCard HxC Floppy Emulator Preordering is now open !!!! Last edited by Jeff_HxC2001 on Mon Jul 12, 2010 7:09 pm, edited 3 times in total. Wow, I'm really curious if our Paypal friends will be OK with this. For us, >1 week shipping time was a reason why we had to completely cancel Paypal-based preorders, they went as far as freezing all our Paypal money, so beware, it's not fun after that, it took me half year to become "legal citizen" again. mikro wrote: Wow, I'm really curious if our Paypal friends will be OK with this. For us, >1 week shipping time was a reason why we had to completely cancel Paypal-based preorders, they went as far as freezing all our Paypal money, so beware, it's not fun after that, it took me half year to become "legal citizen" again. Thanks for the information, i will communicate this to lotharek. I have read the PDF but it does not state how many floppies can a 2GB card take? Can it boot the Atari AUTO folder on floppies? wongck wrote: I have read the PDF but it does not state how many floppies can a 2GB card take? wongck wrote: Can it boot the Atari AUTO folder on floppies? yes. the device replace the floppy disk drive and you can boot on it. , and transfer data back and forth between them? Thanks, and I hope I didn't make that too confusing. I think what dark-lord is asking is can multiple drives be emulated at once with one emulator using just the internal cable? Personally I don't think such capability would be necessary cos you can always set up a RAM drive to use as an intermediary and swap disks with a single emulated drive. Plus you can use an emulator with multiple emulated disk drives to transfer files between disk images, copy them to your SD card and re-insert into the Atari. alexh wrote: I think what dark-lord is asking is can multiple drives be emulated at once with one emulator using just the internal cable? 2 disks drives emulation will be available soon. it's suppose to emulate a floppy drive. So use it like a floppy drive. You should only have A: & B:, the rest are harddisk drive. It's TOS that does the copy from A: to B: and TOS will ask you to swap diskette (assume it's only 1 drive). So my guess is that you between the two disk images via the emulator (next & previous buttons I suppose). Jeff_HxC2001 wrote: 2 disks drives emulation will be available soon. This firmware update, will it be do-able without additional hardware/cables ? Can select so many from your menu? hand-holding from any other PC or OS. number from the top of my head) and copy anything from it to the Ram disk or vice-versa? and copy from the Ram disk to a position on it - all without having to reboot? Without the PC how did you get the disk images on the card in the first place? Yes you'll be able to do what you describe. alexh wrote: Without the PC how did you get the disk images on the card in the first place? 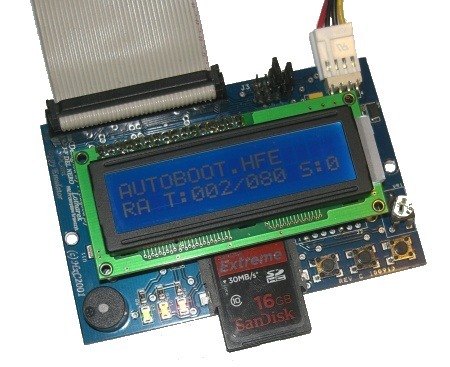 You need to convert the MSA images to HFE (I think this is right, as I seen in the demo ) which the device reads. So if jeff (or someone else) can convert all the demos/games to stuff it in, you just need to write to the SD card once. My Atari systems can already write to FAT32 SD cards on Mint. Are you saying that there will be a HFE converter for TOS/Mint? OK, so if I create a blank empty 1.44MB disk image on the SD card called IMG1.HFE. Can I make a copy of it on MINT, and rename it IMG2.HFE and now I have 2 floppy diskette equivalent? How does TOS knows that it is a different floppy disc as it uses the serial number distinguise one from another (so media change work) ? I need to make a build of the converter for TOS and test it. wongck wrote: OK, so if I create a blank empty 1.44MB disk image on the SD card called IMG1.HFE. One solution is to format HFE file/virtual floppy on MINT. Otherwise i can add the auto change of the serial number in the hfe generator. Jeff_HxC2001 wrote: One solution is to format HFE file/virtual floppy on MINT. formatting a virtual floppy will not destroy the image??? Sync bits etc will be lost, no? This sounds very masochistic considering your PC/Mac probably hosts your .ST/.MSA collection at the moment. Not to mention you could probably batch convert your entire .ST/.MSA collection (even unzipping them in the process) using a modern x86 CPU in under an hour where it will take days on an 030/060. Sure it would be good to have these tools on the Atari for the odd one-off disk which has never been imaged before but surely not for entire collections. yeap. most likely be leaching off some site with a download manager. so it will definately not be on PeeCee in the first place. Batch conversion and all will definately be faster there as well. Moving all to a 2 GB SD, writting also seems faster on the PeeCee than on my Falc.